It's been two years since the last Reaktor upgrade, and Native Instruments have certainly not been idle during that time — version 5 incorporates some major new features. The two biggest changes occur at the surface, where the graphics have been enhanced, and also down in the depths with a completely new set of 'Core'-level technology components. The first of these changes finally lets programmers abandon graphical convention and create any user interface imagainable, while the second liberates the sound designer from having to use the included modules when creating new synths. Instead, those with sufficient experience can write their own low-level Core cells, so if you don't like the sound of any of the existing filters, for instance, you can create your own. Of course there are plenty of new functions as well, and changes to existing ones, plus some new modules. However, for many people, it will be the new bundled library that makes them sit up and take notice — not only has a considerable amount of work been put into designing new instruments and effects, but many of these also incorporate new filters, envelopes, and effects that use some of the new Core cells. The increased sophistication and sound quality is quite noticeable in some cases, while the various new and attractive user interfaces are, I suspect, just the beginning of what we will see in the future. Back in 1999, Dr Sync (aka Vadim Zavalishin) introduced his Sync Modular software synth to the world. It ran under Windows and BeOS, and rapidly gained an enthusiastic following for its versatility and low CPU overhead. Unfortunately, the interface of Sync Modular looked outwardly very similar to Generator/Reaktor, which soon brought it to the attention of Native Instruments. Happily, this resulted in NI asking Dr Sync if he'd like to work with them. 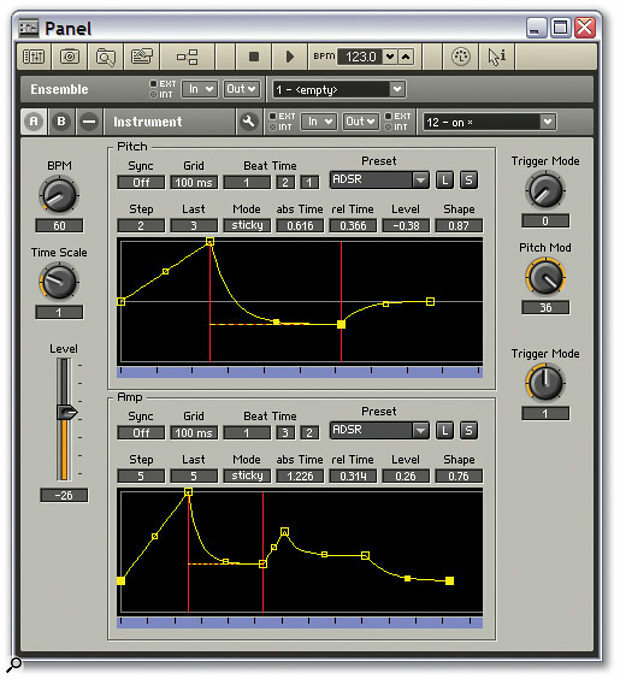 So from June 2003, further Sync Modular development ceased, and existing users were offered the opportunity to crossgrade to Reaktor. And two years on, the technology that first appeared in Sync Modular has now resurfaced, in a rather more sophisticated form, as the new Core technology in Reaktor 5. For anyone still not familiar with Reaktor 's terminology, here's a brief recap. 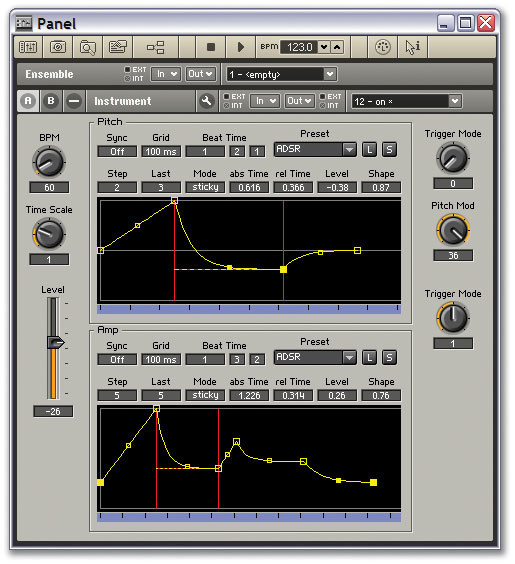 Ensembles comprise one or more Instruments that can each be driven from a different MIDI channel for multitimbral use. Each Instrument has its own Panel to house the various knobs, buttons and other controls, while the various Modules used in its design are connected together in the Structure windows with virtual patchcords, and there's also a handy library of predefined assemblies of modules named Macros, so that you don't have to start from scratch every time you design a new synth. The main change in Reaktor 5 is that since there's a new set of Core Structures that work at a much lower level, the previous Instruments, Macros, and Modules are now referred to as Primary Structures, to differentiate them from the new ones. 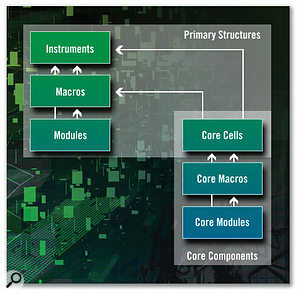 The new Core cells act as a bridge between the primary and core levels of Reaktor, and contain their own Core Macros and Core Modules just like the higher-level Primary Structures. I personally think it's unfortunate that NI chose the term 'Cell' for the bridge between the two layers, since to my mind it suggests a lower-level function than the Core Macros and Core Modules. This initally caused me a lot of confusion when reading the various manuals, but once you get stuck into using the program, things become a lot clearer. Here you can see the Structure of one of Reaktor 5's new Core cell Macros, complete with some of the more advanced Macros available to expert designers. Given these extra layers of complexity under the surface, I'm please to report that the outward appearance of Reaktor 5 is often less confusing than before, since NI no longer let you launch separate Panel windows for each instrument in an Ensemble. This ability has been abandoned in favour of a single Ensemble Panel window in which you can easily display any combination of currently loaded instrument panels, while the main Reaktor toolbar is now considerably less cluttered, since many of its elements now appear on the updated Ensemble toolbar. 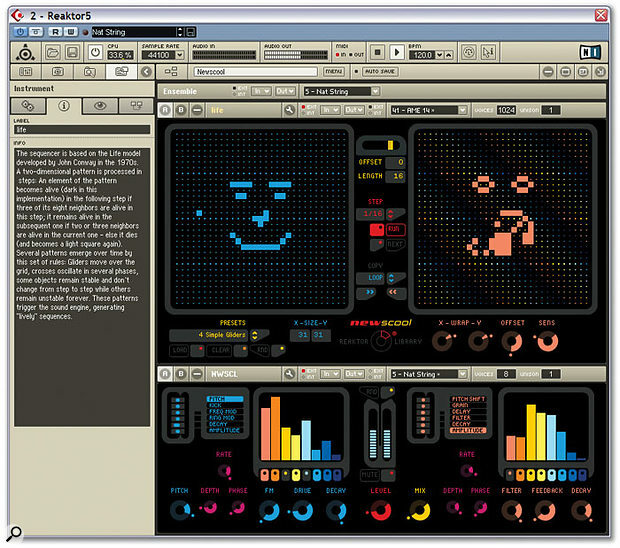 The latter now provides icons that launch the Snapshots (presets) window, the Browser window to load in new items, the Properties dialogue box containing more detailed information about various aspects of each design, the Structure window, the Stop/Start clock buttons for sequenced instruments and the like, a tempo selector, a MIDI Learn button to quickly assign controllers to any front panel control, and the Show/Hide Info button, which displays more information about many of the Reaktor objects when you hover over them. I found these new placements far more convenient and quicker to use. There's also an icon to launch the new Panel Set bar, where you can store up to eight combinations of instrument panels (some visible and some hidden) and switch between them with a single mouse click — this makes managing complex setups a lot easier. 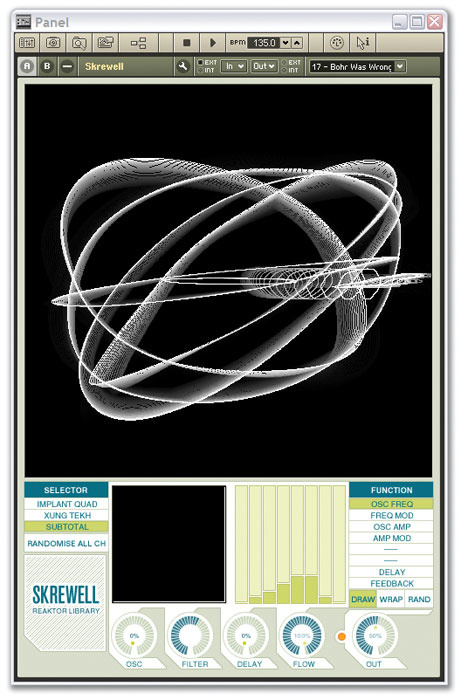 Reaktor 5 provides two levels of functionality to users intending to design new synths and effects: Primary and Core, each with its own Macros and modules. The Structure window now has its own toolbar, which provides Browser, Properties, and Show/Hide Info buttons. One of these launches the Ensemble Panel. There are helpful Bookmark and Jump to Bookmark buttons when navigating the various levels of your creations, and a Debug button for use with Core cells (more on these shortly). Reaktor 5 now displays all Structures (Ensemble, Instrument, Primary Macro, Core cell, and Core Macro) in the same window, although you can open several Structures in separate windows if you wish. The header bar at the top of each instrument has been changed in various ways since Reaktor 4, and now looks rather more sophisticated, with the A/B panel selector and Minimise buttons given a more prominent position on the left-hand side. There's a new dedicated button for the lock/unlock panel feature that switches between changing parameter values and physically moving the controls to another location, and there are now four MIDI indicators — the single MIDI activity lamp of version 4 is replaced by External and Internal MIDI In and MIDI Out, with drop-down In/Out menus, so that you can set parameters such as the MIDI channel that each instrument will respond to, the Audio output channel it's routed to on your interface, and the MIDI output it sends data to if applicable. The header Mute/Solo buttons have disappeared altogether, although you can still perform these functions from the Instrument Properties page. New on the Properties page is more control over the number of voices — the voice allocation along with the minimum and maximum number of unison voices can now be locked, which is handy if you've found the optimum setting for a particular instrument to avoid unnecessary CPU overhead and don't want to accidentally disturb it. There's also a Voice and MIDI Slave option in the same page, so you can adjust polyphony and MIDI channels from one instrument in an Ensemble and have the others set to these same values automatically. Dedicated Reaktor users will welcome the heavily reworked Macro section of the library, which gathers together the various lower-level modules to form useful time-saving sub-assemblies for your own designs. These macros now include an enhanced collection of 'Classic Modular' Macros containing two new sections: Audio Modifiers contains waveshapers, slew limiters, and clippers amongst others, while Event Processing includes a quantiser and randomiser. Even better, the 'Building Blocks' section of the Macro library now includes such gems as the multi-stage envelope generators beloved of Absynth and FM7 users, a MIDI monitor to allow you to examine the data coming into your instruments, a phase-correlation meter to display the stereo image information, and a good batch of basic effects blocks. Reaktor 5 includes no new Primary audio or processing modules, because low-level functions will now be designed using the new Core-level functions. However, there are some new Primary modules concerned with other areas of the application, as well as various other smaller improvements. The Mouse Area module can read mouse movements, clicks, and drags, but NI say that it's more likely to be used in conjunction with the new Multi Display and Poly Display modules that generate and manipulate graphical objects, such as those generated by the Game Of Life used in the redone Newscool Ensemble, plus the new matrix sequencers (see the 'Bundled Library' box). The Stacked Macro and Panel Index modules are designed so that multiple sets of controls can share the same area of the front panel. They are used to great effect in the Carbon 2 synth (above), which incorporates three tabbed panels in its left-hand Oscillator section to control pitch modulation, waveform modulation, and sync, and three on its right-hand side in the Modulation/Master section, covering global properties, effects, and modulation sources. Switching between the six sets of controls using the tabs certainly results in a much smaller and far more elegant panel layout. The MIDI In and MIDI Out sections of the library both have new Channel Message modules that receive and send a group of separate MIDI messages to or from other instruments internally, or to and from other external MIDI gear. For example, from a string of MIDI data received by the MIDI In Channel Message module there are four outputs transmitting the type of data (note, controller, and so on), its MIDI channel number, the note or program-change number, and its velocity or aftertouch value. The Auxiliary library menu now includes a new Voice Shift option to rearrange polyphonic input values across output voices, and a Snap Value Array, so that you can for instance store sequencer data in snapshots. The IC (Internal Connection) Send and Receive modules can act like wireless connections between different instruments in an Ensemble, and the Numeric Readout module lets you display the current value of any internal parameter on the front panel. Smaller improvements include a horizontal bar showing average, peak, and overload in different colours on the existing CPU meter, although as it's just one pixel high, I admit that I didn't even notice it until I read about it in the manual! You can also now delete Structure wires by dragging their input port end to a blank part of the Structure. Reaktor 's predecessor Generator started life with a decidedly uncool laboratory look, complete with sky-blue panels and dark-blue knobs and buttons. When it morphed into Reaktor with the addition of audio functions, this colour scheme simply changed to green panels with black controls. By Reaktor 3 there were user-definable colour schemes, and bitmap-import options so you could add custom logos and the like, but it was Reaktor 4 that added the switched A and B panels to keep designs outwardly simpler, and graphical backgrounds with alpha channels (transparency) for the controls so they remained visible. Reaktor 5 takes things a lot further with panel skins — faders, knobs, buttons, lamps, meters, and switches can all have their appearance customised. Fader skins can either be single-picture skins of the handle or multiple-picture animated skins, while the knob and most other skins are always animated. This removes the final graphical obstacle to truly innovative interface design, and the new bundled library incorporates quite a few radical looking panels, from the slick modernity of the new Spacemaster2 reverb to the colourful minimalist look of the Skrewell visual sound design workstation and the almost toylike appearance of the SQ8x8 step sequencer. For those intent on a little DIY synth design, it's the new Core cell library that will probably be more interesting than anything else. When you right-click inside an instrument Structure window, there are now four types of object that you can add to your designs — another Instrument, one of the Built-In (primary) Modules, a ready-built Macro, or one of 50 new Core cells, sorted into various categories named Audio Shaper, Control, Delay, EQ, Oscillator, and VCF. Reaktor 5 features slick new toolbars, the new Panel Sets window shown down the left-hand side, and graphical features like the tabbed panels across the bottom of this Carbon 2 synth, courtesy of the new Stacked Macros module. Given that all four object types can be wired into your creations in exactly the same way, the casual user can simply benefit from these new Core cell designs, and from new Core cells that will be made available as free downloads for registered users on the NI web site. NI are also putting more emphasis on developing new Core cells in the future rather than new primary modules, and they have already included quite a few new filters, oscillators, and effects in the new Core cell library that are used in many of the new Ensembles, instruments, and macros. However, the new Core cells actually employ completely new concepts — while NI provide them with a similar visual design environment to the rest of Reaktor, they actually use an integrated run-time compiler that turns the underlying low-level code into new modules and allows designs to be tested immediately. Effectively, where before you could design synths by connecting together some of the supplied oscillators, filters, and amplifiers, now you can also design new oscillators, filters, and amplifiers from the ground up. NI rightly claim that their new Core Technology is the largest technical advance in Reaktor since its first release nine years ago, and they are hoping that with access to these much lower-level Core cells, designers and educational establishments will now be able to create radically new Reaktor designs with unique sounds that just wouldn't be possible using the previous 'primary level' modules and Macros. Those of you that intend to delve into these deeper areas of the program will notice that if you open up the Structure windows of a Core cell, it has slightly different colours, and the extra Debug toolbar button mentioned earlier, while the window itself is divided into three areas separated by vertical lines, with input modules on the left, normal ones in the middle, and outputs on the right. In addition to being able to choose from items in the existing Core cell library, the Core cell menu also includes two extra options labelled New Audio and New Event, which let you create new Core cells of these two types. Event cells can only deal with data tasks, accepting other events as inputs, and outputting them in modified form, but they do consume significantly less CPU power than the Audio ones, which can accept either event or audio input signals, but always output audio ones. Essentially, audio cells are the ones to reach for when designing oscillators, filters, effects, and so on, while events are in charge of controls and other data manipulation. Once a new Core cell appears in your design, you open up its Structure window and add items to it using a new selection of right-click menu options that are fairly similar to those for Primary Structures. There's a sub-menu of Built-in Modules, although this time they encompass very low-level tasks such as Maths (addition, subtraction, multiplication and division functions), Bit manipulations (such as AND, OR, XOR, and NOT), and basic Read and Write functions. The Expert Macro submenu contains further sections for higher-level maths, modulation, memory, and data-clipping functions, but I suspect most beginners will initially rely on the Standard Macro submenu selections, which contain far more familiar entries covering EQ, LFO, VCF, Delay, Logic, Event Processing, Enveloper, Control, Convert, Audio Mix-Amp, Oscillator, and Audio Shaper functions. It's possible for those with sufficient knowledge to create Core cells that look fairly similar in Structure to diagrams of classic oscillators and filters in DSP text books, and NI provide a couple of examples on their web site showing Core Structures along with the textbook diagrams and equivalent C++ programming code to prove the point. We may see many more plug-in designs from Reaktor users as well, since it's probably easier to develop and debug them using this new graphical interface than with a traditional compiler. Thankfully, there's a separate 210-page manual devoted to the new core functions, with plenty of examples and explanations of how to build optimal Structures that minimise CPU overhead, the use of the Debug mode to trace signal values through your designs, and of course a set of appendices covering the various Core cells and Macros. As an ex-programmer myself, I found it generally well-written if a bit sluggish in places, but you really do need to work through it carefully from end to end to gain a thorough understanding of Core cell design. It's certainly not something to dip into during your coffee break! The new graphical interface is well illustrated by this updated version of the Newscool module, which now incorporates Conway's Game Of Life running as a sequencer, as well as a very different set of knobs and buttons. Gone are the days when a synth-design package could be sold solely on its ease of use or its versatility. Many musicians want instant results, and plenty of them, so including a mature library that shows off the capabilities of the package is a must. With Reaktor 5, Native Instruments have pulled out all the stops with a collection of 23 new or significantly updated Ensembles created by 'renowned artists and designers', complete with extensive preset libraries, new interfaces, and their own 123-page manual. This new library now extends to some 760MB. Long-term users haven't been forgotten either — not only are most of the Classic Ensembles from previous versions included alongside the New Additions, but on the CD-ROM you can find the complete set of Ensembles, Instruments, and Macros from Reaktor 3 and Reaktor 4. I don't have the space to cover all the new designs in detail, but here are some of my favourites. 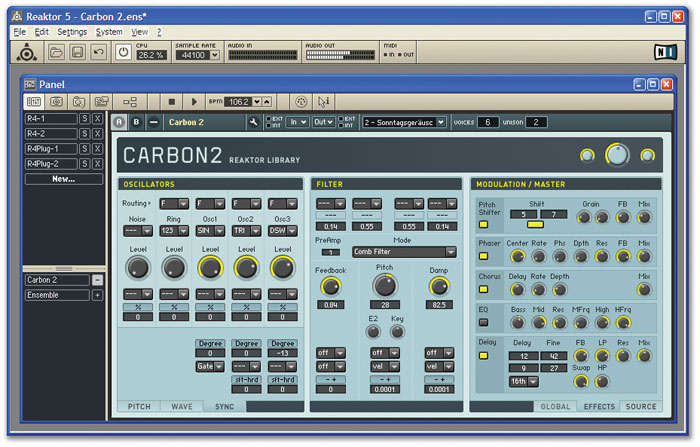 Carbon 2 (shown above) is described as a classic subtractive synth, but that's something of an understatement — although its three oscillators, filter, and multi-effects sections are presented in a easily usable interface, many of its 85 presets are breathtaking in their subtlety and complexity. The oscillators and filters have been specially developed using new Core components, and the manual devotes 11 pages to describing the huge number of options. Subharmonic offers a simple interface but with a complex underlying architecture comprising two synths — an additive sub-oscillator capable of rich chordal combinations and an entirely separate formant oscillator section. Together they can produce sounds from lead lines to rich pads. My favourite in the Grooveboxes section is definitely Massive, whose six tracks start life as samples, but can then be sculpted in a variety of ways using filters, envelopes, and granular resynthesis, all triggered from a set of step sequencers with independent loop length for each track, plus copy and paste functions, and a further three modulation sequencers that you can map to a variety of parameters. With an interface more like an art installation than a synth module, the Skrewell sound generator shows just how far you can now push Reaktor's graphical interface. However, I can't finish this section of my review without mentioning the rebuilt Newscool (above), with an innovative new sequencer based on John Conway's Life model, where elements in the pattern 'live' or 'die' depending on the number of neighbours they currently have. These patterns trigger the aggressive metallic rhythms of the synth engine, and you can load in preset shapes, or draw them directly into the buffer screen using your mouse. In the new Sound Generators section I loved Space Drone, whose collection of 96 parallel voices are based on the outputs from noise generators which are then envelope-shaped, band-pass-filtered, and placed in the stereo field. Its 61 presets range from ghostly winds, bird song, and metallic drones, to slowly evolving collages, which are great for science-fiction soundtracks and meditation. I must also mention the eight-oscillator Skrewell, whose large display is more like an art installation than a synth interface. Finally, Lurker has at its heart two independent delay units, but its four internal sequencer tracks turn this into a rhythmic sequencing tour de force, by letting you map the parameter values to rearrange the incoming sounds. With a filter, envelope generator, and yet another delay, the sounds that emerge are often almost unrecognisable. I had no problems installing Reaktor 5 under Windows XP, and as with version 4, the copy protection is via challenge/response — when you first install the program, a System ID is generated from various hardware components in your computer, and this appears when you run the Registration Tool. To receive the corresponding Authorisation key you can either go on-line and click the Register Now button, or use the Save Registration File button to save an HTML page on your hard drive that you can transfer to another Internet-enabled computer. In either case, you'll receive an email containing your authorisation key, which you can then copy and paste into the appropriate area in the tool. You can even fill out a form and post your details to NI, although obviously this is a last resort. You'll need Internet access anyway if you want to download updates and items from the now bulging on-line user library that currently offers over 2000 instruments. Whatever you decide, there's a generous 30-day demo period, which means you have plenty of time to get your authorisation key before the program times out. I initially installed Reaktor 5 alongside my existing Reaktor 4 installation, loaded both instances into Cubase SX as VST Instruments, and then loaded up the same Ensembles and instruments into each. Despite careful listening, I couldn't hear any audible differences, and the CPU overheads in each case were almost identical. However, once I'd moved from the Classics library folder to the one labelled New Additions, both audio and visual improvements were immediately obvious — there are some gorgeous new designs on offer, while many of the sounds are simply wonderful (see the box on the library on the previous page). The toolbar changes all made day-to-day use significantly easier than in previous versions, and I found the new Core cells library easy to use, although it's going to take many hours of diligent effort before I completely master the new Core-design features. I didn't experience any glitches or other problems during the review period using the new library instruments, nor when working through the various core tutorials. However, I did suffer one bad crash while modifying parameters deep in one of the Properties pages, although perhaps I inadvertently chose some unsuitable values. There are lots of new Macros to incorporate in your own synths, including this multi-stage envelope with flexible breakpoints. 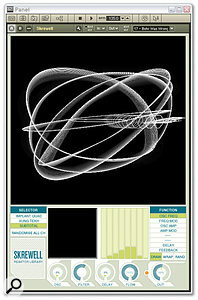 Reaktor 5 has added incredible capabilities at the surface level of the user interface and also deep down at the code-creation level, and professional designers must be rubbing their hands in glee at the prospect of creating even more sophisticated synths, samplers, and effects, with revolutionary interfaces and bespoke DSP programming. I suspect that some people will now be tempted to use Reaktor 5 to create exciting new synths and effects that NI could even end up marketing as stand-alone products. Casual users are also going to be bowled over by the capabilities of the excellent new bundled library, which should appeal to even more people than before, since it now caters for those who want delicate organic textures as well as those into harder soundscapes. I can think of absolutely no reason for existing owners not to upgrade other than lack of cash, or for existing users of the now discontinued and playback-only Reaktor Session not to do so to experience the new version 5 library (for a limited time Reaktor 5 is available to them at the same upgrade price as other Reaktor users). There are a few dissenting voices in the middle ground of enthusiastic amateurs who suggest that Reaktor 5 and its bundled library is now too sophisticated to be understood by some of its followers, and that the element of raw DIY excitement has gone. I also suspect that new users may be overawed by the prospect of designing a new synth from scratch (despite the various tutorials on offer in the manual) or even attempting to modify some of the now incredibly advanced library instruments with their graphical overlays. Ultimately, I suspect that the majority of users will probably rely on a few relatively expert ones to design and circulate new Core cells and new Ensembles that incorporate them. However, many of the v5 Ensembles have themselves evolved from much simpler beginnings, so I feel there's still plenty of room for the DIY approach. Overall, Reaktor 5 looks more sophisticated, sounds better than ever before, and is bundled with by far the best library to date. Even if you don't intend to become a synth designer, you should still get lots out of it! On Macs, OS 10.2.6 or later is required, along with a minimum of a G4 1GHz machine with 512MB of RAM, although NI recommend OS 10.3 or higher with a minimum G4 1.67GHz processor. PC owners will need Windows XP, a Pentium III 1GHz or similar processor and 512MB of RAM, but a P4 2GHz or Pentium-M 1.5GHz is recommended. In real terms, and particularly if you intend to run your sequencer on the same computer, I think we can safely say that the faster your processor, the more Ensembles you will be able to run at once inside your sequencer. New interface with total visual 'skinnability'. Core technology lets synth designers dig deeper and fly higher. Much better Macro library for DIY use. Some users may be overwhelmed by the new Core Technology options. The extra graphical layers make examining the factory designs more difficult. 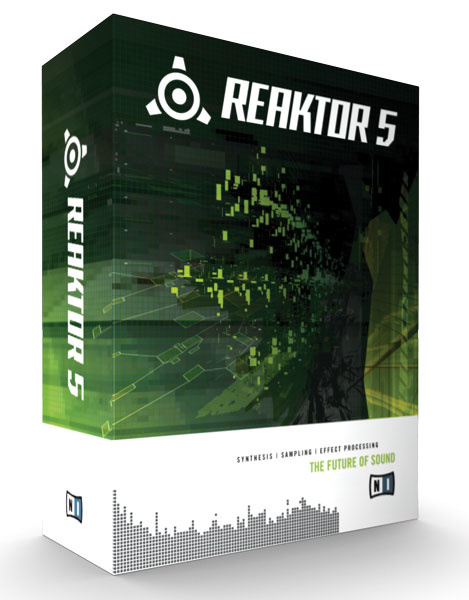 Reaktor 5 is the latest and by far the greatest version of this already extremely popular synth-design package, and offers a huge bundle of sophisticated new instruments that should tempt all of its existing users to upgrade, and well as attracting plenty of new ones. Reaktor 5, £379.99; upgrade for registered users from versions 3 or 4, £129. Prices include VAT.